Khandra is a band I think I'm going to enjoy. The Belarusian black metal duo has seemingly sprung out of nowhere and self-released their debut EP "All Is Of No Avail" in October. The cover art is simple yet striking while if you put both song-titled next to each, they'd form a pretty harrowing sentence of their own. It's no surprise then that shortly after the original release, US label Redefining Darkness Records saw fit to put out cd version (now sold out). There will soon be a tape version released via Norway's Gravplass Propaganda. This is extremely solid melodic yet vicious black metal. Where Death Has Settled In Life is all-encompassing with metallic riffs taking centre stage alongside relentless percussion blasts. The vocals are low growls and they’re used sparingly, as Khandra lets their orchestration take centre stage on “All Is Of No Avail”. The layers of guitar at the start of Presence Is No Longer Relevant make it sound like there’s a choir in the background of the recording, but there isn’t. It’s just the harmonies overlaying each other. The song itself is paced slightly slower at times but is no less theatrical. The use of repetition is good as well, as Khandra relies on the more traditional verse/chorus/verse-type structure. The production and mastering pushes the release up another level as well, which is really impressive for a band that seems so new. The two fairly lengthy songs on show here will leave you content on the one hand but also impatient for a longer release from the band. 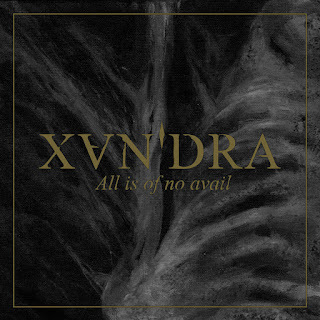 “All Is Of No Avail” could well be a late candidate for both extreme metal’s “Best Newcomer’ and “Best EP” of this year.